The recently established Garden Route National Park (GRNP) along the Cape south coast of South Africa occurs in a landscape where indigenous forests, fire-prone fynbos shrublands and fire-sensitive plantations of alien invasive trees are interspersed. We used the area as a case study in the challenges facing conservation managers in the achievement of biodiversity goals in a fire-prone environment. We explored the context within which fire management was practised during the past century by interviewing former catchment managers and reviewing forestry and catchment management policies. Mountain fynbos adjacent to plantations was subjected to burning regimes aimed at the protection of commercial timber resources rather than the preservation of fynbos biodiversity. Prescribed burning of fynbos adjacent to the plantations was typically done in multiple belt systems at rotations of about 4-8 years during spring, summer and autumn, to avoid the winter berg wind season. Such short-rotation and low-intensity fires favour resprouting graminoids over slow-maturing reseeders, and likely account for the compositional impoverishment observed in fynbos near plantations. Current and future challenges faced by the GRNP include (1) balancing conflicting fire management requirements for plantation safety against fynbos conservation; (2) the continual invasion of fynbos by fire-propagated alien pines sourced from plantations; (3) inadequate resources to redress the 'invasion debt' caused by the socio-economic legacy and past management neglect; and (4) fragmentation of land use between conservation and forestry threatening the sustainability of the region at large. We provide recommendations for management actions and research priorities to address these challenges. In the exceptionally diverse7 and threatened8 Mediterranean-climate (summer drought, winter rain) biotas of the world,9 fire is the most important ecological disturbance factor and predates humans in these ecosystems.2,10 Mediterranean floras have evolved specialised post-fire persistence traits, which are sensitive to the specifics of fire regimes, such as seed banking in the soil or canopy, resprouting, and fire-stimulated flowering and germination.9,11 Fire is instrumental in maintaining diversity in the fynbos of the Cape Floral Kingdom (CFK) of South Africa,12 and may be considered the most important fynbos management practice, being both a key ecological factor and a practical tool for resource manipulation. The fire ecology of fynbos has been well researched since the early 1970s and by the 1990s fairly detailed fire management prescriptions were available.13,14,15 However, much emphasis was on the western, strictly winter-rainfall part of the CFK12,16 and the inland arid mountains,17,18,19 whereas the eastern coastal part of the CFK has been neglected. The climate of the eastern coastal part is less seasonal (rainfall is bimodal20,21) and species' phenology,22 and possibly plant growth and maturation rates, differ accordingly, which has implications for the management of fire regimes. Improved understanding of fire ecology is becoming increasingly important as climates change, protected area networks expand, pressure from alien invasive biota increases, the wildland-urban interface enlarges, and demands to manage fuel loads of natural habitat for asset protection grow.4,15,27,28 Where new protected areas are established, systems are likely to be poorly researched and management prescriptions may have to be made in the absence of a clear understanding of ecosystem processes and responses. Recent additions to protected areas are often not in pristine condition and are affected by historic management that has implications for management into the future. The recent establishment of the Garden Route National Park (GRNP; ~130 000 ha29) along the Cape south coast of South Africa involved the amalgamation of certain parcels of land. These land parcels have in the past been variously managed for water conservation, biodiversity conservation, plantation forestry using alien invasive species, and the harvesting of natural resources, mainly timber from indigenous forests.30 We used the fynbos areas of the GRNP as a case study for exploring the challenges facing conservation managers in the achievement of biodiversity goals in a fire-prone environment. Our analysis was underpinned by a number of issues. Firstly, the GRNP is located within the south-eastern coastal part of the CFK where fynbos fire ecology is inadequately understood. Secondly, it is a new park, and a reconstruction and critical review of past fire management approaches is needed. Thirdly, the institutional history and landscape context of the park pose particular difficulties that need to be addressed by the fire management policy, including high levels of invasion by alien trees, and significant pressure from the adjacent plantation industry to reduce wildfire hazard. Being a new park, there is still opportunity to influence the management policy and practice in the interest of biodiversity conservation. In this paper we present the environmental and institutional context within which historical catchment management practices in the region of the GRNP evolved, and we consider how the adoption of a new mandate, with conservation as its central goal, will require changes to research priorities, management actions and land-use practices. 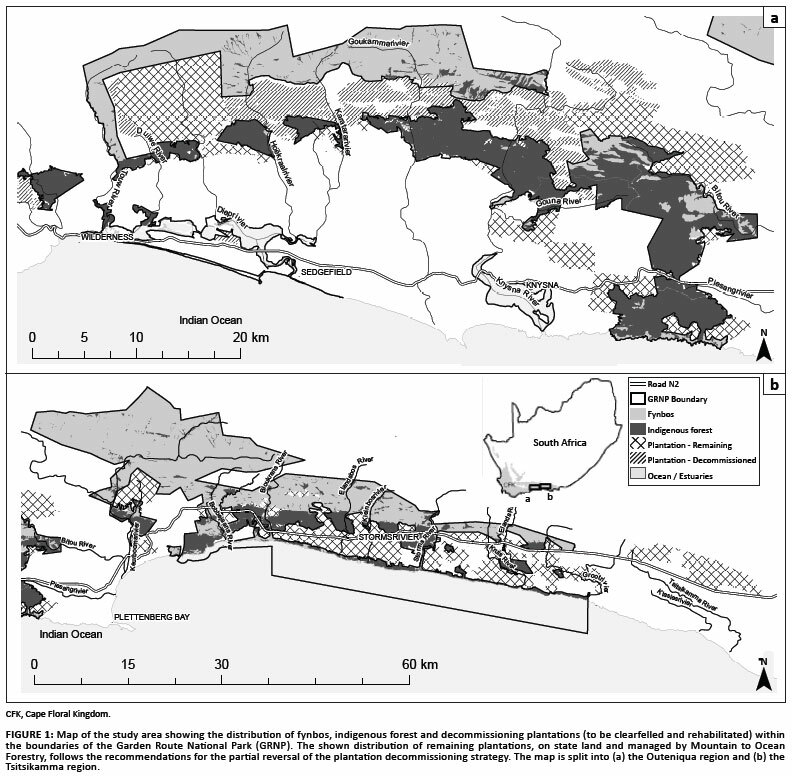 Plantations of alien pine trees (Pinus pinaster Aiton and Pinus radiata D.Don) have fragmented and replaced large tracts of fynbos, mostly along the lower and mid-mountain slopes (Figure 1). The plantations of Bergplaas, Karatara and Buffelsnek in the Outeniquas, and Kromrivier in the Tsitsikammas, reach deeper into the upper catchments. The extant fynbos of the GRCMs thus typically abuts the commercial plantations to the south. Depending on the topography and altitudinal reach of the plantations, the fynbos forms a belt of 2 km - 6 km wide, and is generally narrower along the Outeniquas than along the Tsitsikammas (Figure 1). Considerable tracts of unprofitable plantations in the Outeniqua Mountains are in the process of being phased out, scheduled for rehabilitation to fynbos and incorporation into the GRNP during the next decade.40,41 The landscape setting of the GRNP is thus a mosaic of fynbos and forest amongst remaining and decommissioned plantations, most of which were formerly owned and managed by the state (the extent of these land groupings is indicated in Table 1 and Figure 1). 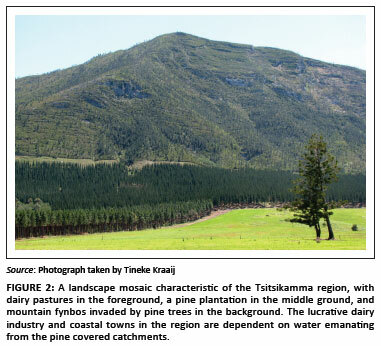 The mix of fynbos and fire-prone pine plantations in the landscape has led to two major management problems: (1) the need to protect the plantations from fire, which kills the adult trees; and (2) invasions by fire-adapted pines, where fire drives the rapid spread and proliferation of these species42 (Figure 2). The generally held notion at the turn of the 19th century was that forests increase rainfall.24 Afforestation was accordingly seen as a beneficial land use in mountain catchments which otherwise had limited economic potential.24 However, droughts, public complaints about reductions in stream flow, and alleged desertification of South Africa during the first half of the 20th century prompted the Department of Forestry to undertake hydrological research in mountain catchments.24,47 This research exposed the high water consumption of plantation trees,48 which led to the introduction in 1972 of an afforestation permit system to regulate new afforestation according to impacts on catchment run-off.43,49 Although it was by then recognised that afforestation competes with the conservation of water supplies and floral diversity, plantation forestry in the GRCMs was justified because 'surplus water [is] presently still flowing into the sea from the humid coastal mountain ranges'30. 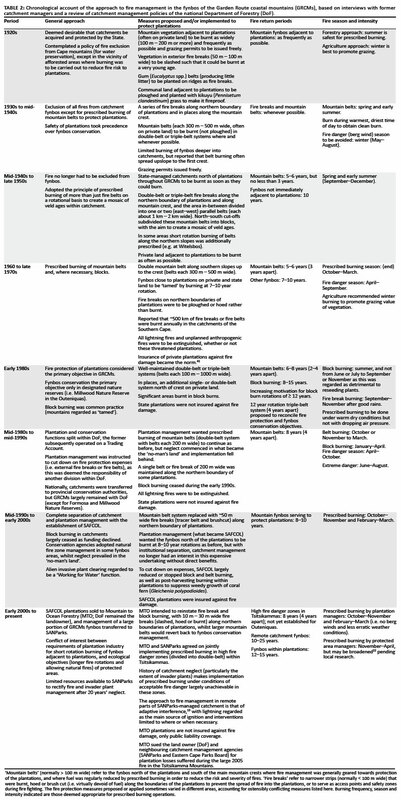 The general approach to fire management in fynbos mountain catchments during the 20th century is presented elsewhere.15,30 Here we specifically focus on the approach to catchment and fire management in the GRCMs during the past century, as informed by our review of historical policy and management documentation and interviews with past and current land managers (Table 2). Prescribed burning of mountain fynbos became fully accepted as a management practice during the 1970s to promote water, soil and biodiversity conservation.30 The general approach to fire management was based on, and continually influenced by, sound ecological principles emerging from a productive fynbos research programme at the time.14,15 However, and in contrast to policies elsewhere in the fynbos, nature conservation was the primary objective only in parts of state catchments zoned as nature reserves. Fire protection of plantations was the primary objective in vast areas of fynbos in the GRCMs to the north of the plantations (Table 2), where high-hazard, berg wind-driven fires characteristically originated. For the conservation of fynbos, moderate to high-intensity fires at 10-20 year intervals are optimal.15 Conversely, for plantation protection purposes, it is desirable to burn adjacent fynbos vegetation under cool, safe conditions as soon as there is sufficient fuel available to sustain a fire, usually at vegetation ages of 3-8 years, depending on site characteristics. Various systems have been proposed and/or pursued in the GRCMs in an attempt to reconcile this fundamental conflict of interest.23 The most common approach has been the so-called double- (or triple-) belt system (Table 2). Accordingly, fynbos to the north of the plantations was divided into two to three parallel belts, each burnt at a fixed rotation, for example every eight years but four years apart. The vegetation age in one of the belts would consequently always be four years or less, thereby reducing the likelihood of fires spreading from catchment fynbos to the plantations. In some cases, plantation managers aimed to burn the fynbos adjacent to the plantations as soon as it could burn. It is clear that fire management in the GRCMs has, since the establishment of the plantations until the early 1990s, been primarily aimed at the protection of commercial timber resources (Table 2). Although it is unlikely that catchment managers managed to execute prescribed burning every time and everywhere as planned, it seems reasonable to assume that large parts of the GRCMs' fynbos have at times been burnt at shorter fire return intervals, and lower intensities, than those deemed ecologically desirable for fynbos conservation. Both frequent and low intensity fires in fynbos and other Mediterranean-climate shrublands favour resprouters over slow-maturing reseeders.59,60 This preference may account for the dominance of graminoid sprouters and the paucity of slow-maturing reseeding shrubs of the Proteaceae family in parts of the GRCMs, particularly in areas near plantations (Kraaij T, personal observation). With regard to fire season, prescribed burning has mostly been carried out during spring, summer and early autumn (October to April) in order to avoid the winter berg wind season (May to September) associated with conditions of high fire danger and an increased risk of uncontrollable fires (Table 2). The conflict of interest in terms of fire management (fire return periods in particular) in the GRCMs has been brought into sharp focus by the separation of plantation and catchment management functions within DoF, and later the privatisation of plantations and handover of catchment management to conservation agencies. Catchment management has further been complicated, ecologically and economically, by the extensive infestations of invasive alien plant species (particularly Pinus spp.) almost exclusively sourced from adjacent plantations, with hardly any invasive alien plant control carried out in the 'no-man's land' in almost two decades61 (Figure 2). Sustainable management of the current conservation-plantation matrix will not be achievable in the study area if the continual invasion of the surrounding landscape by self-sown timber species is not controlled.53 The current environmental and social certification system (the Forestry Stewardship Council, FSC), adhered to by the plantation industry67 inadequately appraises environmental accountability (i.e. spread of invasive trees and their impact on water resources) beyond the borders of the plantation management unit. Indeed, in 2004, environmental NGOs requested that a moratorium be placed on further certification of plantations worldwide, which led to a review of standards for FSC certification of plantations.41,68 The development of new standards and the implementation of trial audits have not resolved this issue, which remains contentious amongst FSC stakeholder groups. Whether plantation forestry can be undertaken sustainably in South Africa and whether it should be certified remains an open question.67 Biological control, which may be seen as the only viable option for the control of vast infestations of invasive pines in remote catchments, continues to be opposed by the plantation industry.42,69,70 Legislation pertaining to the control of alien invasive plants is not enforced, whilst a discrepancy between the capacities to enforce legislation pertaining to fire risk management versus invasive plant control70 intensifies the conflict between the conservation and plantation sectors. This conflict is evident from substantial legal claims instituted against conservation authorities for fire damage to plantations in recent years (Table 2). Finally, the sustainability of both sectors is additionally compromised by government's decision to partially reverse the plantation decommissioning programme.58 The outcome will be a more fragmented landscape where neither plantations nor protected areas can be suitably consolidated or coherently managed in terms of fire, invasive plants or general operations44 (Stehle T 2010, personal communication, November 25). The challenges associated with managing the new national park are substantial, and knowledge and solutions are not always available, which indicates the need for further research. Firstly, understanding of the historical fire regime in the area and how it has changed during the past century71 has to be improved through the creation and analysis of a database of historical fire records.72 Ongoing accurate mapping of future fires is furthermore necessary to serve as a basis for the design of natural experiments and fire management decisions.28 Secondly, the ecological requirements of eastern coastal CFK fynbos in terms of fire season and minimum fire return intervals need to be determined. To this end, post-fire recruitment success and youth periods of slow-maturing reseeding species (e.g. the Proteaceae16,18) should be studied. Similarly, the youth periods of invasive pine species need to be established under local conditions. In combination, these should inform fire management guidelines aimed at facilitating fynbos conservation and invasive pine control. It should furthermore inform thresholds73 within which fire managers can attempt to resolve the conflicting demands of fire hazard reduction and biodiversity conservation. Thirdly, a legal review should be conducted to consider the practicalities of implementing fire legislation in the face of conflicting land management objectives (fire risk vs. biodiversity conservation). The respective responsibilities applicable to the conservation and commercial forestry sectors in terms of fire and invader plant legislation need to be clarified. This clarification should facilitate cross-cutting compliance and cooperation without the need for costly legal action. Lastly, resource economics research should further explore alternative funding for alien plant clearing initiatives in watersheds. Approaches based on payment for ecosystem services38 should be expanded, targeting major water users, such as agricultural industries, municipalities and the tourism industry. Cost-benefit analyses need to compare the environmental and socio-economic advantages of invasive plant clearing versus desalinisation of sea water as different means to secure water supply to water-stressed coastal towns39 (Preston G 2010, personal communication, October 01). Land owners and managers in the area need to realise that fynbos and plantations cannot be fire-proofed.71 It has been shown for fire-prone shrublands and forests across the globe that large fires are not dependent on a build-up of fuel, and therefore frequent burning to reduce fuel loads will not necessarily reduce the risk of runaway wildfires.27,74,75,76 The combination of fire danger restrictions and financial constraints furthermore makes large-scale prescribed burning of catchment vegetation unattainable.27 The most effective strategy for facilitating fire safety where necessary is to focus effort on (limited) strategic locations. A legal review should furthermore clarify the respective responsibilities of the conservation and forestry sectors under current fire legislation. Official agreements between neighbouring land managing agencies should clearly stipulate fire management protocols, and should be formalised within regional Fire Protection Agencies. Owing to successive institutional disruptions in the study area, the collation of fire management related policies, practices and data has been challenging. Our account constitutes a first qualitative regional history of fire management in the CFK published in the primary literature. Such published accounts will become invaluable where there is a reliance on tacit knowledge, and particularly where institutional memory is rapidly fading. Fire management in the fynbos catchments of the new GRNP presents considerable challenges that cannot be overcome without addressing the invasive alien plant problem in the area. In the short and medium term, substantial resources will be required to correct the situation left by decades of management neglect. Longer-term sustainability of the region necessitates rationalisation of the currently highly fragmented land use with their conflicting requirements. We thank all interview respondents for their willingness to share information, knowledge and experience. We appreciate access to the archives of MTO Forestry and DoF (now Department of Agriculture, Forestry and Fisheries), in particular the assistance of Theo Stehle at the Knysna regional office. Kobus Venter made documentation available on the plantation decommissioning process. Johan Baard prepared Figure 1 and shared the data contained in Table 1. The comments of Dr W. Vermeulen and two anonymous reviewers resulted in improvements to the manuscript. We acknowledge SANParks, the Nelson Mandela Metropolitan University and the Council for Scientific and Industrial Research for supporting this research.